It took a little longer than I had expected, but my latest free WordPress theme, Lovecraft, is now available as a free download from WordPress.org. 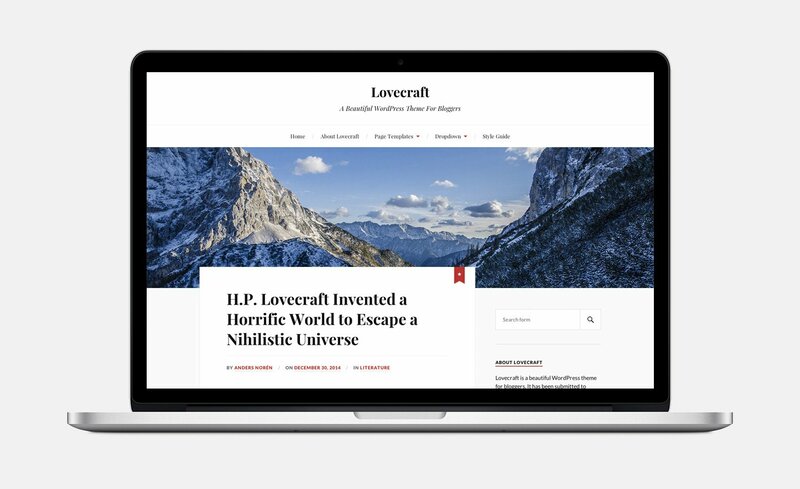 Lovecraft is a beautiful two-column theme for bloggers. It features a responsive design, great typography, a full-width header image (which is replaced with the post thumbnail on single posts/pages), custom accent color support, custom logo support, editor style support, a Flickr widget, recent posts and recent comments widgets with thumbnails, and a full-width template. Lovecraft is less about functionality and more about style. It has a carefully considered and very crisp design with strong colors, a beautiful combination of serif and sans-serif fonts (thanks, PlayFair Display, Lato and Georgia) and a simple post content area with focus on readability. The simple layout and subdued colors help the header/post thumbnail images pop. It is, in short, a proper bloggers’ theme. If you’re a fan of Lovecraft, I’d love for you to give it a mention on Twitter or a review over at WordPress.org. If you’re feeling really generous, you can also give me a small PayPal donation. Donations helps me keep my spirits up and body caffeinated.